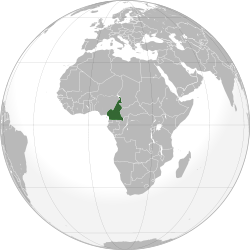 This page is a translated version of the page Wikimedians of Cameroon User Group and the translation is 1% complete. This page is currently undergoing some updates and more information is being added to it including translation. Wikimedians of Cameroon User Group is a Wikimedia User Group (UG) that has the goal of supporting Wikimedia projects in Cameroon, supporting Cameroonian Wikimedians, and becoming the recognised chapter in Cameroon. Note: We are a Wikimedia User Group, and not the Wikimedia Foundation or Wikimedia or Wikipedia. We are a group of volunteers helping to reach out to our community members and make them aware of the activities happening in the Wikimedia movement. This is to ease communication. Promote the use of Wikimedia products in Cameroon and installation of MediaWiki software if need be in various locations. Also, promoting the use of Wikipedia in research institutions, such that they can get information anytime and anywhere when need arises. In general, creating massive awareness of Wikimedia and its projects in the Country. Sensitising the Cameroon community about opportunities in the Wikimedia movement such as : Job Opportunities, Outreach programs, GSoC program, Conferences, Hackathons, GCI for secondary school students and more Wikimedia related activities to promote the movement in Cameroon. Organise events in which volunteers will add more content to Wikimedia projects such as; Photowalks, Hackathons, Edit-a-thons, Writing Contests, etc. All these activities will be carried out by the User Group in order to fill the gap and document Cameroon content on Wikipedia and other Wikimedia projects. Build a strong team of developers to contribute to Wikimedia related projects including and especially MediaWiki. This team members and interested parties could be responsible for fixing bugs, building new products and improvement on the MediaWiki software, its extensions and other Wikimedia projects. Building a team of volunteers and interested persons to write articles (ranging from 100 - 10000) about Cameroon-related content.This will be achieved through Edit-a-thons to edit articles, improve existing articles, and more activities to make information related to Cameroon and Africa as a whole up to date on Wikipedia. Promoting Wikimedia projects and free content in general and to encourage the use of Wikimedia resources in education (primary, secondary and tertiary levels). Organisation of conventions, conferences, meetings, workshops, etc. Develop a Website for the Wikimedians of Cameroon User Group to harness all information about the UG in one place - Hackathon. In addition to the Wiki pages, Commons, Wikidata item etc... This website will also consist of link to all the Wiki pages and resources we have now. The website will be the centre of all the resources, write ups and anything that mentions the UG in it. Edit-a-thons; Wikithon Cameroon 1, 2, & 3. Like and Follow our: Facebook Page for updates. Follow us on Twitter: WikimediaCM. This page was last edited on 13 September 2018, at 20:38.